Our time in Madrid was fabulous. A nice little tester of a different Spanish lifestyle, a different city, but it was time to return home to Barcelona. We had the opportunity to “sleep in,” which means Kaitlin still wakes up before the alarm. I don’t think I slept too well last night as my brain was buzzing the entire night of things to do and research, papers to write, places to go, people to get in contact with; the usual. I did have the chance to meet up with a friend, Allee or Allegra Batista, as she is now known. I mentioned yesterday that she is studying in Madrid and had recommended a great place for authentic paella. Mom, Liz, and I met up at Starbucks for breakfast. Liz and Allee choose a muffin and cinnamon roll while Mom and I sampled Starbuck’s mini yogurts and of course I got my favorite latte drink. It is becoming the new coconut-dark chocolate gelato combo, but a bit on the healthier side. A bit. It was pretty funny because she would explain things about Spain as if we had never heard of them. 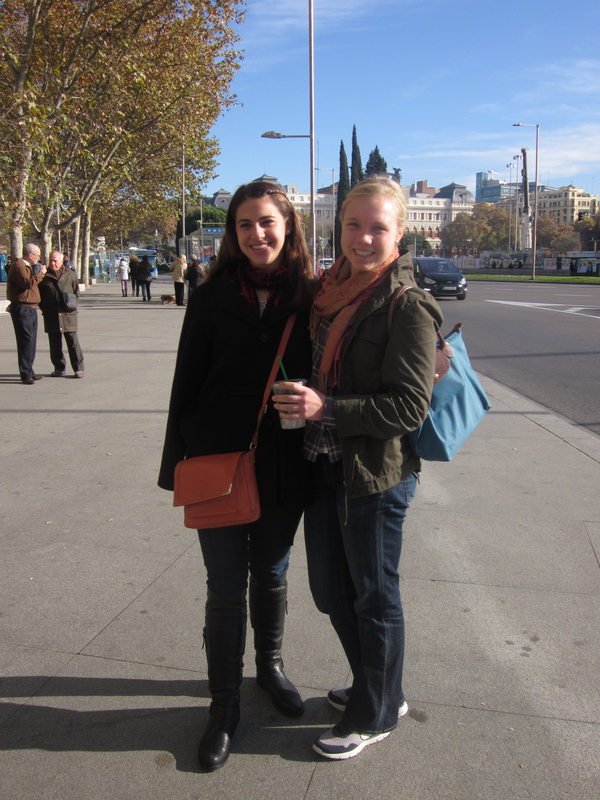 Tapas, eating late, walking everywhere, public transportation, and a different language. Yep, last time I checked I had been studying in Barcelona and heard all about them too. 🙂 What a knucklehead. We were so lucky to have such wonderful weather this weekend. It could have easily been raining and cold every day, but instead we entered and explored the city with beautiful sunlight and just a slight chill, perfect for late November. After sending Allee on her way to the metro, we walked to our hotel, packed our bags and went to sit in the modern lobby and work. Around 12 our requested taxi arrived to take us to the airport. It was about 20-30 minutes and cost about 30€, a little more convenient than the hour plus transportation through metro. I had been warned about the difficulty of the Madrid airport, how we HAD to arrive at least three hours in advanced and so on. However, we were able to glide through security with our carry-on luggage. With 2.5 hours still to go until we boarded the plane, we sat ourselves down and waited. I worked on my communication paper and just about wrapped it up. Mom was a little fidgety as she had finished her book and didn’t have much else to do. She picked up a magazine, crossword puzzles, and I gave her my phone to play fruit ninja. Boarded around 4:00pm and took off around 4:20, then landing back in Barcelona around 5:40pm. We loaded ourselves into a taxi back to Conchita’s, although I was pretty sure our taxi driver was about ready to leave us on some random corner and ask for our money. Not only did he take one of the strangest routes home, but also he kept taking his seatbelt off, zooming through the streets like I have never seen before, and looking around. I did a quite unpacking and re-packing job of things to send home with mom while she skyped Meghan and Dad. I’m sure they were thinking, why do you need to talk to us, we skyped 12 hours ago. And to think I only get to skype once every week! Around 6:50 we loaded the giant suitcases on our backs and began trekking our way through the streets of Barcelona. I was vaguely aware of where the hotel was, but not too entirely sure. At one point I asked a man for directions, and through his mostly-Catalan responses, we found our way. Mom did an excellent job at reserving our last night at Hotel Condado, about a 20 minute walk from Conchita’s. It is in the Sarria district and not very touristy, but we did pass a Best Western. I had no idea they were international, let alone Barcelona. (Apparently the company has the “Int’l” at the end and they are present in over 80 countries…blew my theory out of the water) The desk receptionist was a little snappy and when I said I didn’t have my passport, I thought he was about ready to turn me away. I pulled out my driver’s license and all was well again, but really, great customer service, huh? It wasn’t like Mom was sneaking me in; she had reserved a room for two. We unloaded our bags and walked around the streets to look for dinner. Because it was Sunday, most things were shut down, but we were lucky with Roma Pizza, a little corner restaurant where you choose which type of pizza you would like from the counter, they cut it and warm it up and bring it to your table. I choose margarita, which was absolutely delicious with its melted cheese and roasted tomatoes. Mom had an onion, mushroom, and sausage pizza, which was also divine. We sat and chatted for a long time, as I was not ready to call it a night. It has been so nice to have her here, to talk with her, and just laugh. Three weeks will pass by quickly, especially with everything that we both have to do. After dinner we were both in the mood for something sweet. I had no idea what would be open, so we just wandered the streets on our way back to the hotel. Past the hotel we successfully found a bakery/deli with smoothies, turron ready to be sliced, sandwiches, quiches, and all different types of coffee. I have never been into this part of town, so it was fun to see the different stores. Both of us got a small vanilla cupcake (actually listed as “cup & cake”) and a warm class of milk. A perfect ending to a perfect trip. I think the warm milk is my new favorite treat. Off to bed, to start the week, and to sadly, say goodbye to Mommy. I have had such an amazing time and am so blessed and grateful to have you as my mom. The time will of course pass quickly with finals, Amsterdam, and accomplishing all of what Barcelona has left to share, but I can’t wait to see you and everyone else in less than three weeks.